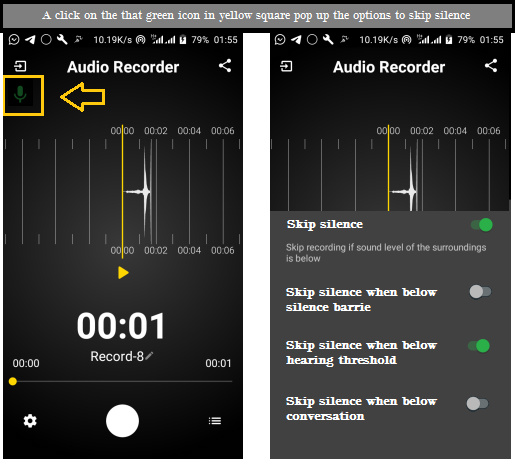 Making audio recorder to skip different level of silence while recording will be a good feature. Audio recorder records sound/voices and also import some files. I've used it well, and I'm still enjoying it. My proposals will be based on voice/sound recording. It is optimized for a fast start which helps user not to miss important voice recording. Rec has two basic recording format which is Advance audio coding (AAC) and Waveform file format. Pause and skip silence: During recording, there can be a different level of quiet time when there will be no sound or different level of sound. Within this period, the recorder will automatically filter the surrounding sound level and control recording till the desired sound returns. At first, I thought it might be difficult to come up with this idea, but I think it's possible. The units for each silence level will be set in the back end. It will not be adjustable by users. db spl is the unit to denote the measurement of a sound. It is referred to as decibel of sound pressure level. Since the loudness of a sound varies for different frequencies and not required with its sound pressure level, the pause and skip silence level is possible to implement. The below images shows the settings of the silence features. Only one can be turn on at a time. The skip silence button will activate others when switched on. 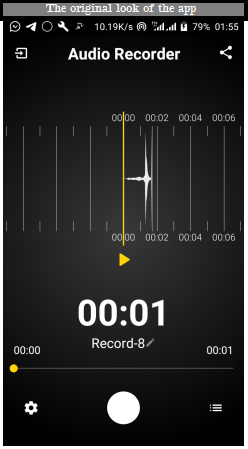 The pause and skip silence can be used to achieve a clear recording. It will make users recording concise and accurate. This feature can be used to achieve the desired result in terms of recording. For instance, if I plant my device in a hidden place to record some malicious conversation, only the important voice sound will be captured. Also, the noisy part of a conversation or a sound recording will be filtered out. Only the clear part will be captured. Quiet times will also be filtered out, and space(either internal or external storage) will be used up wisely. Pause and skip silence is a nice idea and it will add significant value to this application in my opinion. I record lectures daily and that noise and silence between the lectures can be frustrating at times. The implementation of this feature might be tough but it will be a real good addition. The contribution has been written nicely and I liked the detailed proposal. Please write in normal font next time as this font is a little small and can be difficult for some people to read. We are already looking for your next contribution. Thanks for the review @syedumair. You said the idea might be tough to implement, and it will be a real good addition, but you still went ahead to say it's common. Will a common idea be tough to implement? Don't let your comments and the answers you pick be contradictory. I don't care if my post is moderated a second before vote. All I want is a proper moderation. Thank you. I don't know why you always keep complaining! I told you earlier, the answers in the questionnaire are just to adjust the score. So you want me to always keep quiet when I feel like my post isn't moderated the right way. You keep complaining about the questionnaire but I don't think it is as bad as you are stressing on it. The questionnaire do have it's limitations but your moderation will really push people away from the category. I know what favcau and knowledges went through to make the category what it is again when no one was around. I will believe that the questionnaire is as bad as that when you mistakenly score me 200%. I hate to hear that. If you will mark me down, be ready to give me good reasons and stop complaining about the questionnaire. That isn't professional. If the implementation is tough, does that mean the feature can not be common? If a feature is tough to implement then it's highly technical. I'm sure there are hundreds of recorders out there so if you are sure that the idea is common,would you please provide me with just 7 recorder with these features? I am sure there are many with such feature but you know finding them is difficult. See guy, I'm not limited to idea category. There are other categories I can contribute to conveniently. The fact that I stick to idea is because it has become part of me. That was what I started with and I don't think it's okay to wave it aside because of anyone. You can have a look at this moderation. https://steemit.com/utopian-io/@ammarraisafti/writing-simple-notes-by-hand-will-be-a-good-and-interesting-feature#@favcau/re-ammarraisafti-writing-simple-notes-by-hand-will-be-a-good-and-interesting-feature-20190416t152009283z and compare it with my post and your moderation. That post scored 51. Note that there is a big difference between common and rare.. I just hope you are fair with your moderation. Not only on my post but generally. Thank you for your review, @syedumair! Keep up the good work! Hello @ckole,please provide the project's and your Github links,thank you. @SteemEngineTeam would like to take the time to thank you for signing up and participating in our community. Your contributions and support are important to us and we hope you will continue to use our platform. We plan to give back to our community members, so have an upvote on us!